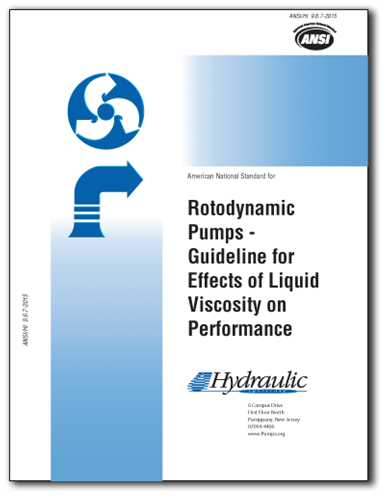 Scope of Standard: ANSI/HI 9.6.7-2015 outlines the method for predicting performance of rotodynamic pumps in Newtonian liquids of viscosity greater than water. The standard applies to single and multi-stage rotodynamic pumps having radial impellers ns = 60, (Ns = 3000), handling liquids exhibiting Newtonian behavior, and a kinematic viscosity greater than 1 and less than 4000 centistokes. What's New: The 2015 version of ANSI/HI 9.6.7 differs from the 2010 version in a few areas. New data has become available as outlined in Section 9.6.7.4.1, including new references in the bibliography. Expanded guidance on the effect of speed versus torque characteristics is found in Section 9.6.7.6.1. Applicable Markets: Oil and gas, petroleum refinery, chemicals, pharmaceuticals and any industry using liquids heavier than water. Content: Viscous correction factors and methods for determining them, procedures to estimate effects of viscosity on pump performance, viscous liquid performance correction limitations, methods for estimating net positive suction head required, pump design effects, sealing issues and more. Who Should Buy This Standard: Pump OEMs who must learn how to test pumps to calculate the difference in performance between water and oil or other viscose materials. Pump users can use standard to evaluate different pumps based on their performance in water and other viscose liquids.